Are your children familiar with the Smurfs through movies or books? They might enjoy making their own Smurf house from recyclable materials. This post has been updated on November 19 2015 with new photos. Unfortunately, I didn't take better photos at the time of the project :) Disclosure: I am an Amazon associate, and this post contains Amazon affiliate links. For full disclosure, please click here, and thank you for supporting my blog! My husband was fascinated with Smurfs since he was a young child. Some boys play with toy soldiers, my husband had his Schleich Smurfs. He spent his childhood crocheting blankets for them, building Lego merry-go-rounds for them, or sending them on various adventures. His parents kept his Smurf collection, and eventually he brought them over. Now our daughter is playing with them. At first, she was rather indifferent to them, but we got some original Smurf graphic novels by Peyo, and she got more enthusiastic about these funny blue creatures. In fact, she started to draw her own Smurfs and Smurf villages, but my husband insisted that Smurf homes should look more “mushroom-like”. 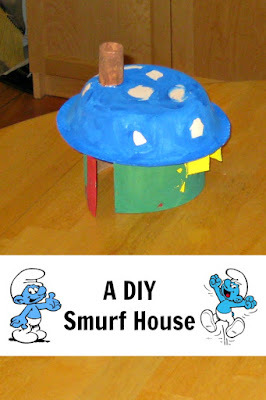 This is how the idea of a DIY Smurf house was born. My husband cut a cereal box in half and made windows and doors with an exacto knife. Smarty was delighted to be able to choose colors for her Smurf houses and their roofs and then went to town painting them. We helped somewhat since she ran out of steam after about 20 minutes. We let the paint dry, and then my husband hot glued a cork “chimney” to the roof. 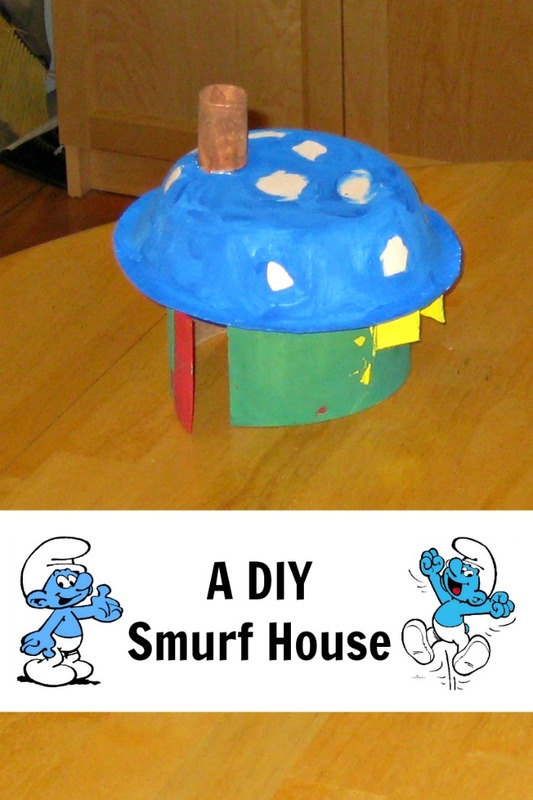 While Smarty enjoyed having these houses for Smurfs, she enjoyed wearing “roof hats” even more. She thought that they look “very fashionable”. Unfortunately, I did not think to make pictures of her actually playing with the houses, and at the moment of refreshing this post they are gone, replaced by forever changing Magna Tiles palaces. Did your kids watch The Smurf Movie or read Smurf books? More 3D Crafts for Kids? Your husband is very cool!!!!! I love the houses. I love the houses, too - and such a simple way to make them! oh I love the Smurfs!! Wonder Mom stole my funny joke. I was wondering if those were oatmeal boxes. In our house they'd be fairy houses, for whatever reason Jeff has decided he doesn't like Smurfs. Much to my dismay. Oh, did you guys see the new Smurf movie? I'm curious if it was good or not. What a sweet thing for your husband to do. I bet Anna was thrilled to watch her little story come to life. So darn cute!! Love this post! YOur little one would love my interactive website-www.littlelillypolkadot.com based on the children's book I authored and illustrated-. The book teaches kids that going to the doctor is not so scary. The website has, among other things, a narrated version of the book. The kids love it!! Also please see my blog!!-www.littlelillypolkadotbedtimeblog.blogspot.com. I used to draw them but never thought of making a smurf village. Very cute! I cannot even imagine my husband making a smurf house, much less a whole village. I think that is awesome. I LOVE that your husband is a smurf expert. How wonderful for him that Anna is now interested! I love that he came up with ways to reuse items! I bet she loves it. What a fun idea and how creative your husband is! Smurfs are a hit at our house right now, too. You have a great husband! I loved the smurfs growing up. This is awesome! I can't believe all that Lars did for his own smurfs, Natalie! He sounds so creative and fun too. Anna's smurf house is so cool. I love how it turned out! I wish I still had my little smurf figures. Did you see the new movie? I haven't heard whether it is good or not. Adorable houses, by the way.